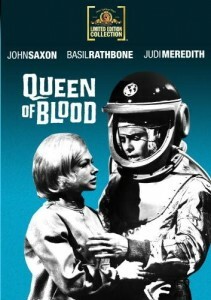 With Queen of Blood, avant-garde-turned-exploitation director Curtis Harrington joins the exalted company of Francis Ford Coppola and Peter Bogdanovich. Each of these filmmakers worked for Roger Corman, and each were charged with “directing” a film around special effects footage originally shot for Soviet science-fiction productions. Coppola’s Battle Beyond the Sun (1962) thoroughly remixed the Soviet film Nebo Zoyot (1959, directed by Mikhail Karzukov and Aleksandr Kozyr), while Bogdanovich’s Voyage to the Planet of Prehistoric Women (1968) re-edited and partially re-shot Voyage to the Prehistoric Planet (1965, which was “directed” our man Curtis Harrington), which itself was comprised of footage from Pavel Klushantsev’s Planeta Bur (1962). If this is all confusing, it was partially meant to be. Sensing a bargain, Corman charged these filmmakers with using the impressive setpieces from the Soviet films, while adding potentially seamless narrative and characterizations to the mix. That many of these films were shot on re-used sets, with ensembles of actors who had previously worked together on other projects, only adds to the commitment to recycling. In this way, Corman and his group of directors were the first truly Green filmmakers. Queen of Blood is the story of a group of astronauts who are sent on a voyage to Mars, in hopes of recovering a crashed alien ship. The unit finds a lone (seemingly female) survivor. A second group of astronauts is dispatched from Earth (a kind of rescue to the rescue), and eventually the crew begins its return home. Although the alien appears human, the crew quickly learns that she refuses food. After establishing a modicum of trust, the alien asserts its true colors at first opportunity by biting and draining a well-meaning astronaut (Paul, played by a young Dennis Hopper). This is certainly no benign being—she feasts upon his blood! The crew temporarily subdues this space vampire and feeds it from the ship’s stores blood plasma. But is the crew justified in bringing this being back to Earth? Is its only interest in humanity a food supply? Exploitation aficionados will relish Queen of Blood’s generational unity. Featuring Basil Rathbone, John Saxon, and Dennis Hopper (with a Forry Ackerman cameo! ), this film directly connects 1940s B- movies and mystery series (Rathbone was a much-loved Sherlock Holmes), all manner of Italian exploitation genres (Italian-American Saxon, whose real name is Carmine Orrico, played in as many Italian films as American), and the American youth film of the 1960s and 1970s (Hopper, justly known for Easy Rider , also had a hand in Corman’s The Trip ). Although the film’s plot covers much of the same terrain as Mario Bava’s superior Planet of the Vampires (1965), the setup—a mysterious, humanoid, parasitic space entity that could potentially make its way back to Earth—became a perennial favorite of the more graphic science fiction of the 1970s and 1980s. Films as loved/reviled as Ridley Scott’s Alien (1979) and Tobe Hooper’s Lifeforce (1985) cover much of the same ground. Queen of Blood does so without the over sexual overtones of the later films, and manages to show as little of its titular blood as possible. Harrington’s efforts show us a well-meaning, if naïve, group of likeable humans who face the unknown. His direction, which is mostly confined to studio spaces that are edited around more expansive footage from its Soviet source, nevertheless creates a coherent narrative out of a potential mess. It is certainly one of the most intelligible of Corman’s jigsaw sci-fi films. Queen of Blood was briefly available on VHS under the name Planet of Blood (Star Classics, 1987). Now, some 24 years since that last home video outing, Queen of Blood is back in circulation, due to a made-on-demand disc from MGM’s “Limited Edition Collection,” as well as a streamable version on Netflix.